One of the nice things about Theatre 29 in Twentynine Palms, is they are still true to their mission statement published some 17 years ago when the theatre opened. They enjoy the support of the City, the surrounding communities, and the gratitude of its many performers, young and old, who have ‘trod the boards’ learning skills they didn’t know they had, and had a great time in the process. The Arts are a wonderful way to expand one’s horizons, open up the world for young and old alike and make friendships that last a lifetime. 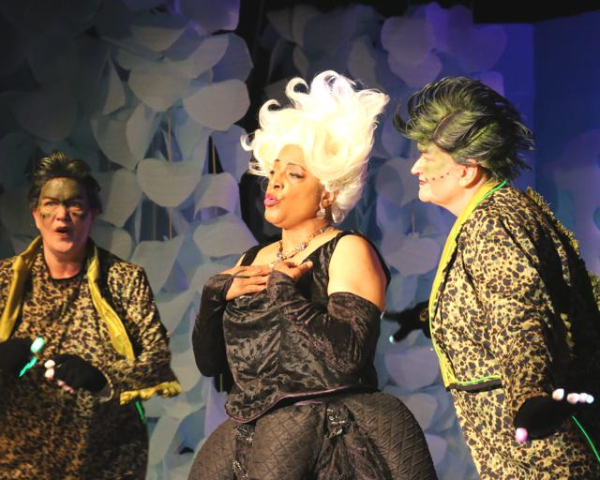 I was made keenly aware, once again, of the power to transform through the arts when I attended a performance of the theatre’s current production “Disney’s The Little Mermaid”, last week. It’s become somewhat of a tradition that theatre co-founder and President Gary Daigneault and Music Director Ed Will produce the annual musical blockbuster production. “The Little Mermaid” is a beloved children’s fairytale originally from the pen of Hans Christian Andersen, which has gone through multiple iterations over the years. The Theatre 29 version has Music by Alan Menken, Lyrics by Howard Ashman and Glenn Slater and a libretto by Doug Wright (all Broadway Tony-winning heavyweights) and it features a cast of 27 performers. When dealing with children’s theatre the story usually isn’t very complicated. It’s usually a prince seeking romance and looking for just that right girl to share his life where they all live happily ever-after. However, that might be a little more difficult to accomplish in this story because human Prince Eric (Graham Cooley) falls in love with siren-voiced sea mermaid Ariel (a lovely Chalise Kunz. Father’s are usually overly protective of their daughters, and King of the Sea, King Triton (a booming Charles Harvey) is no exception. He fears that some human will steal Ariel, the youngest of his eight daughters. It’s the same with Prince Eric’s father. The King assigns Grimsby (Ron Bottorff) to keep an eye on Prince Eric to make sure he finds the right and proper young lady to become his Princess. Triton’s wife has passed and he and his now banished wicked sister Aunt Ursula (a deliciously wicked Robin Wilson) rule different parts of their underwater kingdoms. King Triton has lots of courtiers and servants to help him run his watery empire including Sabastian (Char Childs) the clever crab and advisor to Triton who is charged with keeping Ariel safe. The story follows the usual twists and turns of good winning out over the bad. But not before the principal performers and the cast have a chance to sing their songs – there are twenty-eight musical numbers – and dance their dances choreographed by Mandi Pushkar which by the way, are energetically performed. With a cast of 27 performers who play humans and sea creatures, there isn’t enough room to mention everyone but the following supporting performers contributed in making the show lively and entertaining for the audience: Cindy Daigneault, Patti Brown, Chris Fleischman, and Amanda Winters along with a dedicated cast of teenagers and youngsters. The young, maybe about 11 years-old, girl sitting next me the night I attended, was so fully engaged and enthralled throughout the entire show that when Prince Eric and Ariel, now made human, finally kiss near the end of the show, she leaned forward in her seat as if she was Ariel. Such is power of the theatre to engage and entertain, to say nothing of creating future audiences. Also, there were plenty of proud moms and dads, including grandparents in the audience, all with their faces glued to the stage throughout the show. One might almost imagine they were attending church services; they were that involved. 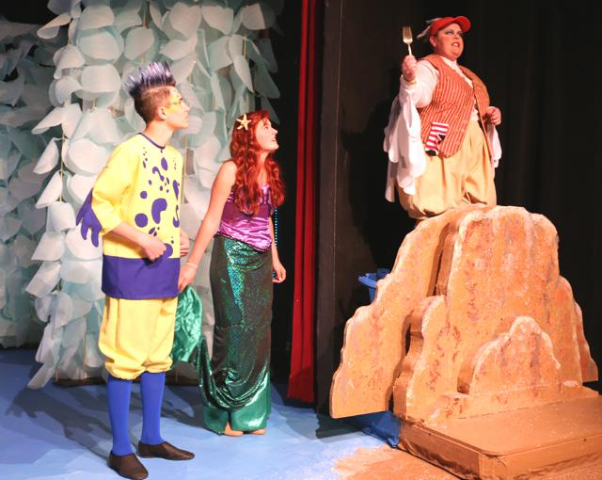 “Disney’s The Little Mermaid” is one of the most ambitious productions Theatre 29 has tackled. And they have succeeded admirably. The set design by director Daigneault along with his technical crew have created several clever special effects to go along with a lighting plot designed by Daigneault and Ken Palmer along with the costumes designed by Kathryn Ferguson. Ferguson, a Desert Theatre League award-winning costumer has outdone herself with this production. The costumes become a character as important as the actor/performers themselves. Ferguson’s construction crew of 31 seamstresses and assistants deserve all the praise their costume efforts have generated. It’s a visually stunning and delightful musical show. Don’t Miss it ! 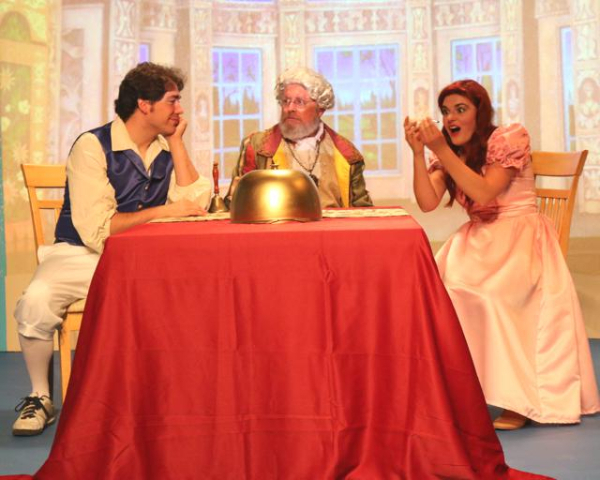 “Disney’s The Little Mermaid” performs at Theatre 29 thru April 9th. Call the box office for reservations and ticket information at 760- 361 – 4151.